The presentation by Peter Tea in early August was as educational as usual. His handout looked like a quiz on everything he has been teaching us for the last year and a half or so. He covered a lot of what he has talked about before, but it wasn’t straight review. 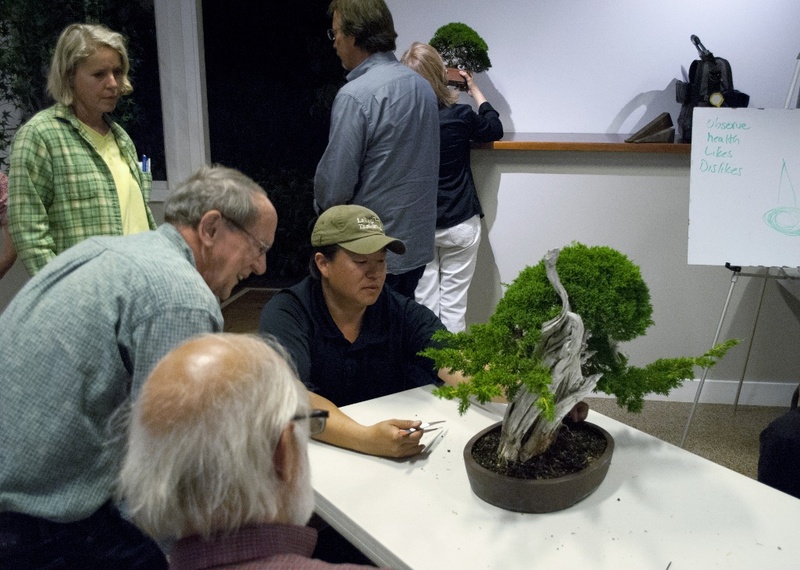 Peter took all those important points (such as the three signs of health we look for before doing intensive work on a tree: bushiness, runners and hardened off foliage) and showed how they fit into an overarching, integrated approach to maintaining a bonsai’s energy balance at a level appropriate to its stage of development. That sounds complicated, but essentially means that the more refined a tree, the more dramatic its response to our manipulations, and what we have learned from Peter allows to more carefully decide what work is appropriate for a particular tree, given its prior development. Trident maple with an ‘I’m wearing wire’ reminder flag. 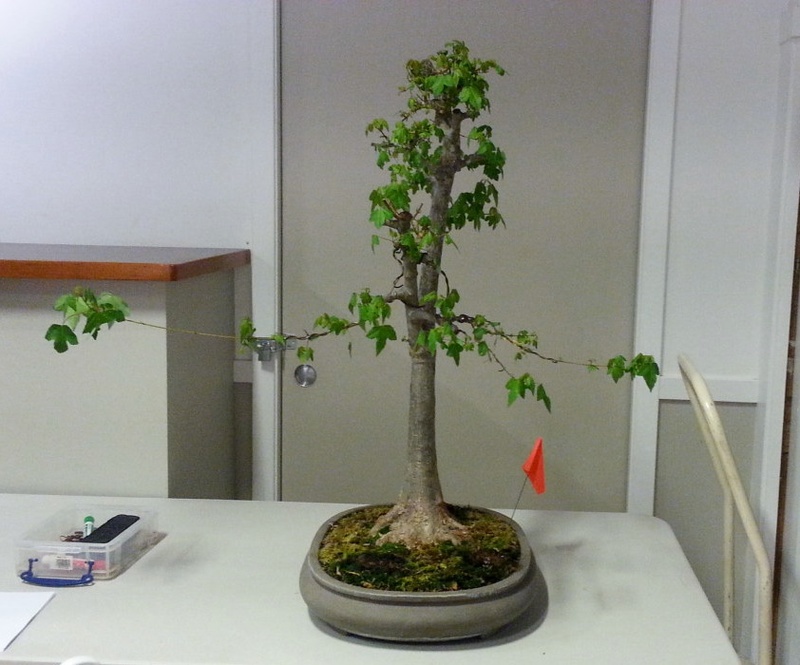 Peter brought the trident maple from last time to illustrate how a tree at that stage of development responds to dramatic cutting. He also had a much more refined tree with him, which he used to engage us in an exercise illustrating how this greater understanding should allow us to look at any tree and tell where the artist is going with it. 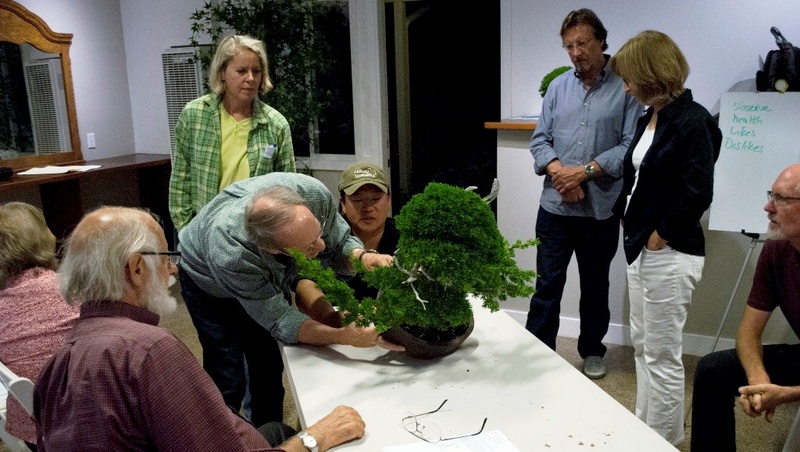 Now that we have come full circle, seeing how everything Peter Tea covered early on dictates when and what we do to our trees, we can apply our techniques more strategically with a deeper understanding of how each cut affects the vigor and future development of the tree. Roger gets a closer look. Be sure to join us in October, when we will have Peter Tea back again.